To give you a break from the usual GNU/Linux/DevOps/Puppet/GlusterFS drab, I’ve decided to have a go at writing a different kind of technical article. 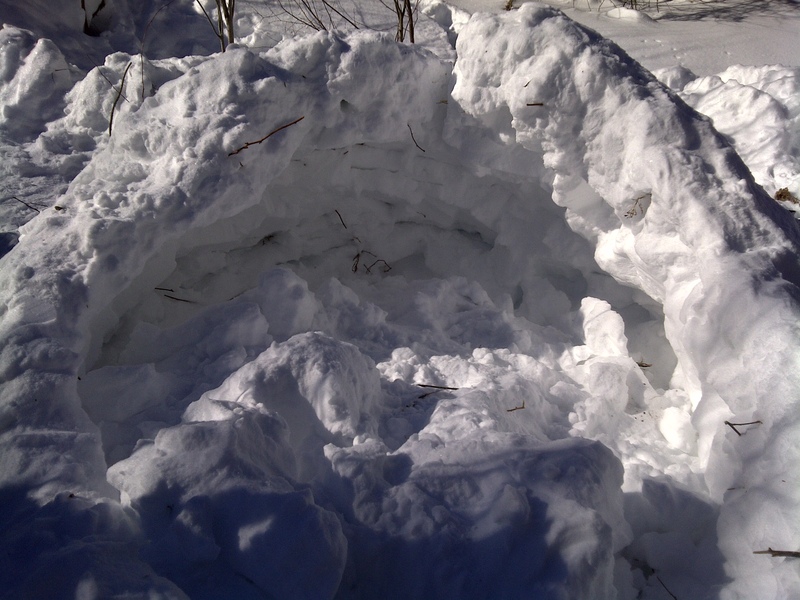 This article will show you how to build the traditional Canadian snow dwelling known as a quinzee. If you will be travelling to Canada, I recommended that you read through this article ahead of time, so that you don’t offend your host by being unfamiliar with their traditional living accommodations. 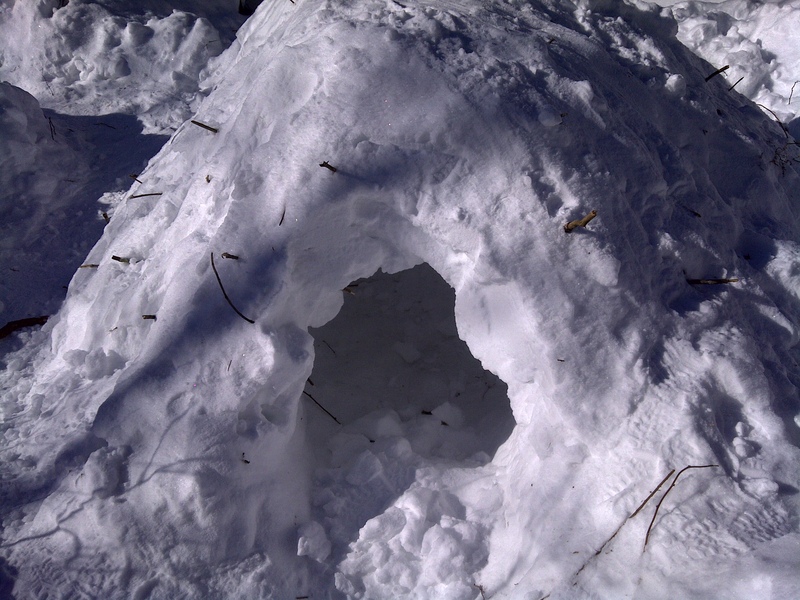 If you are not Canadian or if it is your first time building this type of shelter, I recommend that you have a professional supervise and guide you! If it is not sufficiently cold out (less than 0oC) when you are building or sleeping in your shelter, it could collapse, squashing and suffocating you! If it’s built correctly, a quinzee can safely support the weight of many people, although it is not intended for use as scaffolding. When you are inside the quinzee digging, you must have a buddy outside, standing watch for your safety, in case of quinzee collapse or polar bear attack. Start off by choosing a place to build your quinzee. Usually you’ll build your quinzee near the other quinzees in the village, however for this article, I have decided to set up in a remote location, as this will be used as my vacation home. 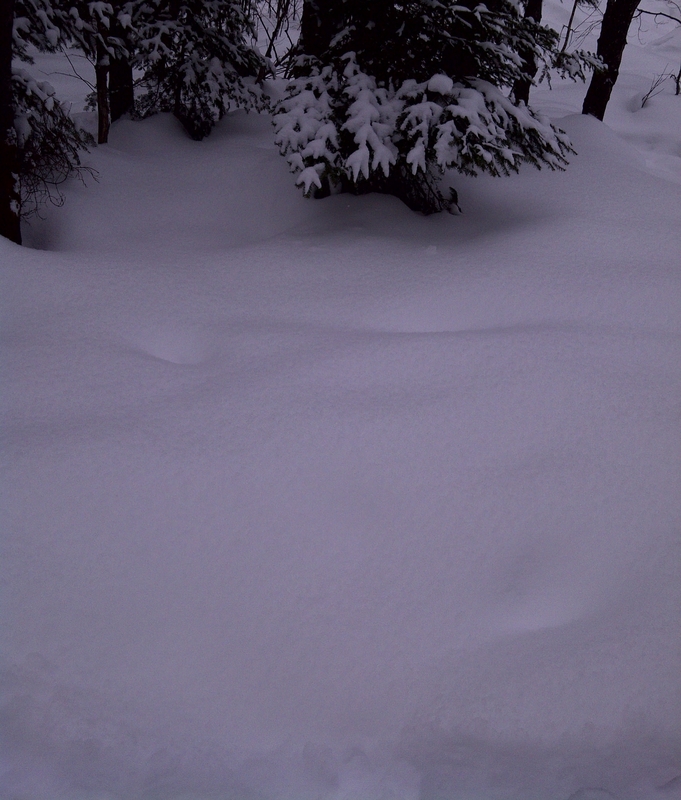 It is good to build on flat terrain, where there is a lot of fresh snow. In Canada, there is always an abundance of snow so it should be easy to find a pristine area. If you build in a wooded area, be sure that there are no trees or dead branches that might fall or break off in the wind and squish you or your quinzee! With each snowfall, new layers of snow are deposited onto the older layers which is called stratification. Since each layer could have different consistencies or strengths, it is important to mix or break up the layering before we build our quinzee. This will make sure that the walls of the quinzee are stable, and don’t shift later on. Here, the layers of snow are destratified with a shovel, in a circle of about two to three metres in diametre. This circle will be the outside size of your quinzee. A three metre diametre quinzee would more than comfortably fit three large sleeping Canadians, which is the equivalent of two standard polar bears wide. 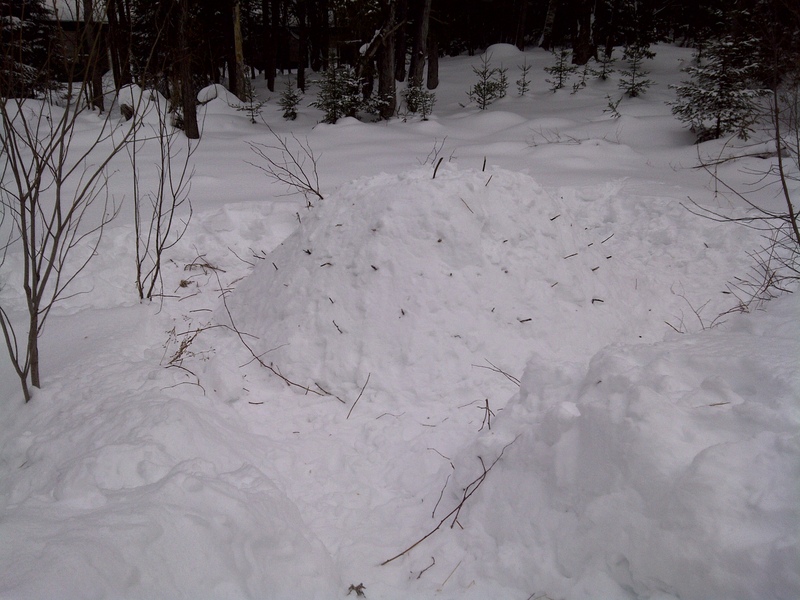 To make a quinzee, you need a large pile of snow. 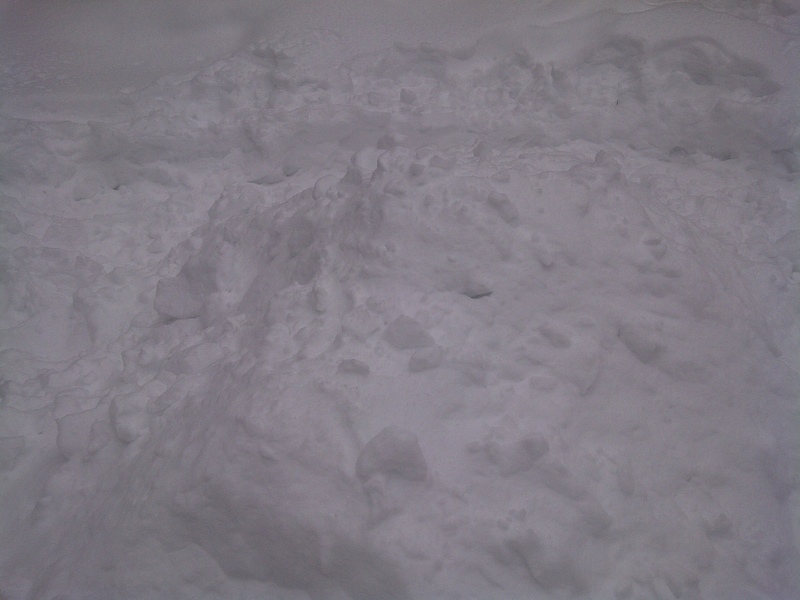 You’ll want to shovel the snow from outside of the destratified quinzee circle, into the centre of the pile. Work your way around the circle, gradually moving outwards as you need more snow. This technique has the added advantage that the area outside of your quinzee will be cleared of snow, and gives you room for stargazing, polar bear watching, and other typical Canadian pastimes. After a few hours your pile will grow large enough that it should be about two to three metres high. 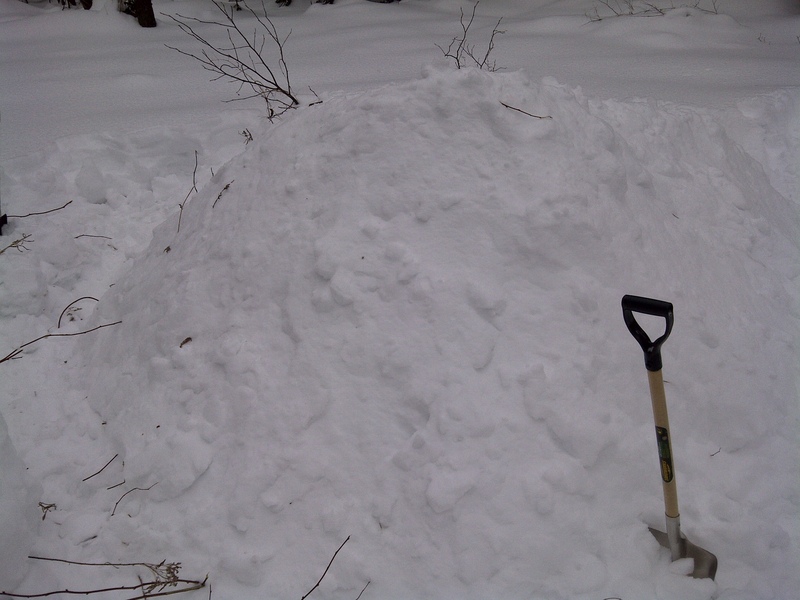 You don’t have to worry about the specific height as long as you always throw the snow on the top of the pile. The pile will automatically spread out to form a larger diametre base if it is too high to be supported on a smaller base. Some quinzee builders will pile their backpacks and other equipment in the centre of the pile under a tarp before piling on the snow. This is a tricky optimization, but if done correctly, there will be less snow to shovel onto the pile, and less snow to dig out at the end. 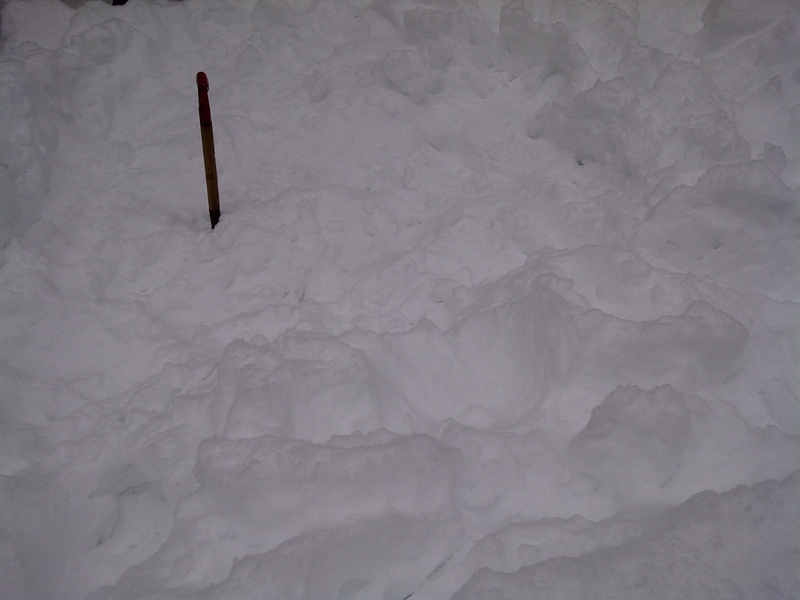 When not in use, make sure you don’t leave shovels or other items lying around on the ground, as they could easily get covered up by snowfall and lost forever. Conveniently, shovels can be stuck into the snow, where they’ll stand upright and remain visible. At this point your pile of snow should now be complete. Congratulate yourself on a job well done and award yourself with a cool mug of maple syrup. 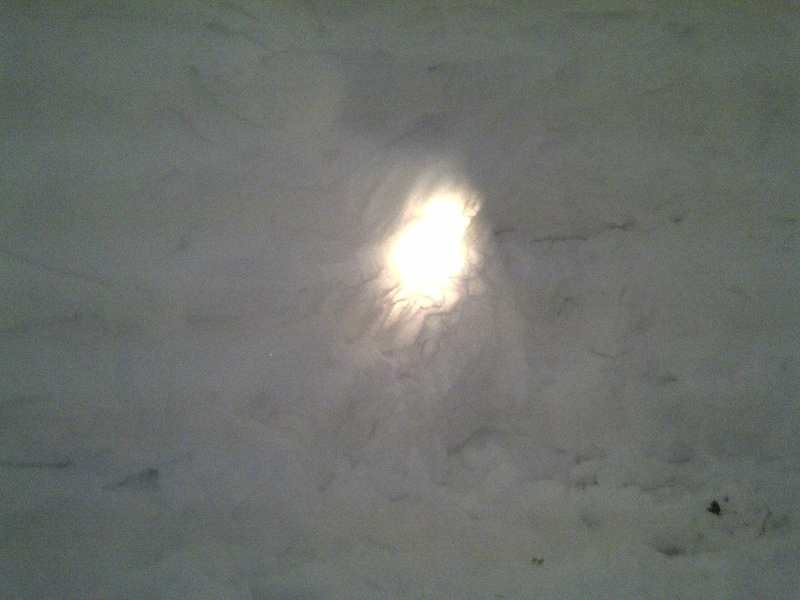 When digging out the quinzee, we’ll need to know how much snow to remove so that we don’t create unwanted windows in the wall of the shelter. 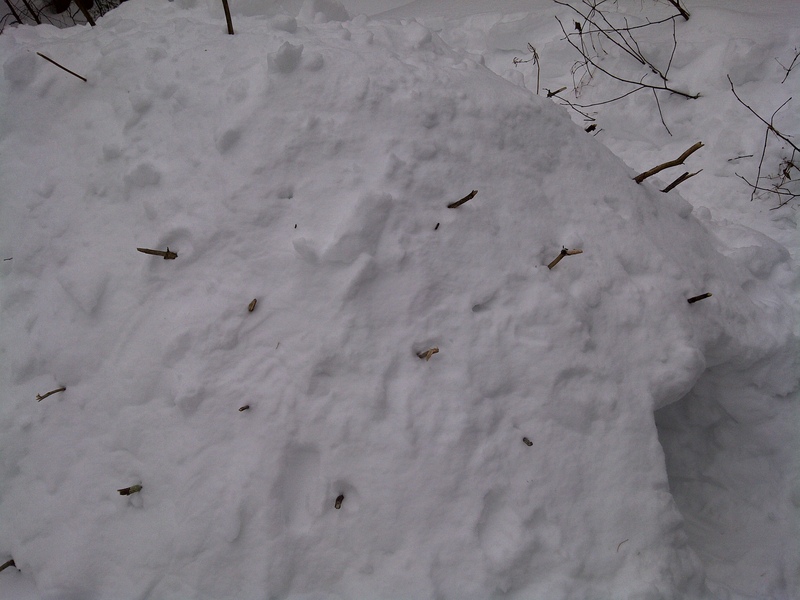 To help keep track of the wall thickness, first gather about 40 to 50 sticks, each about 30cm in length. Insert all the sticks in the wall of the quinzee spaced out about 30cm from one another, and all pointing towards the centre of the shelter. If the sticks are longer than 30cm, it’s okay if they protrude from the outside of the shelter. If they are too short, you can use them for firewood. 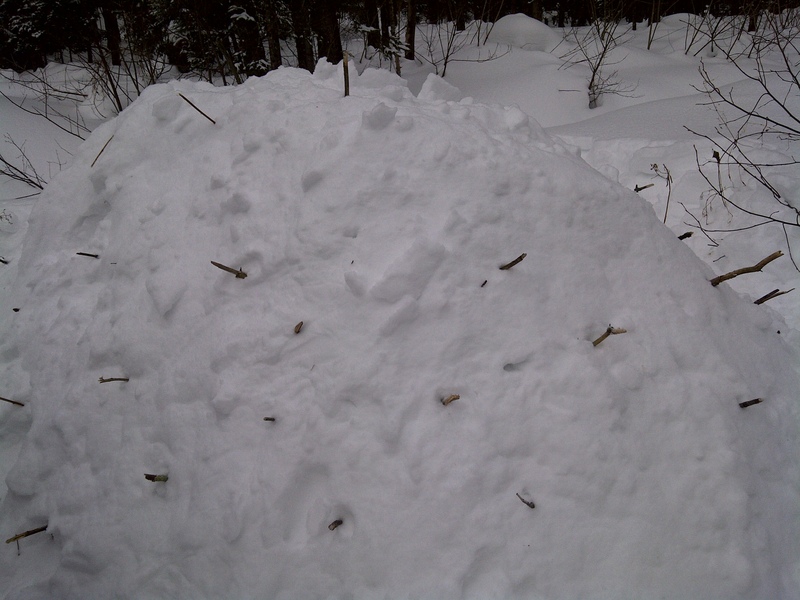 When we dig out the shelter, we should encounter the sticks from inside the quinzee. Whenever you see a stick, you should stop digging in that direction. At this point the quinzee needs time to settle. It typically takes between two and six hours. In this time, the snow crystals will lock together under their own weight, and the structure will harden because of the cold. 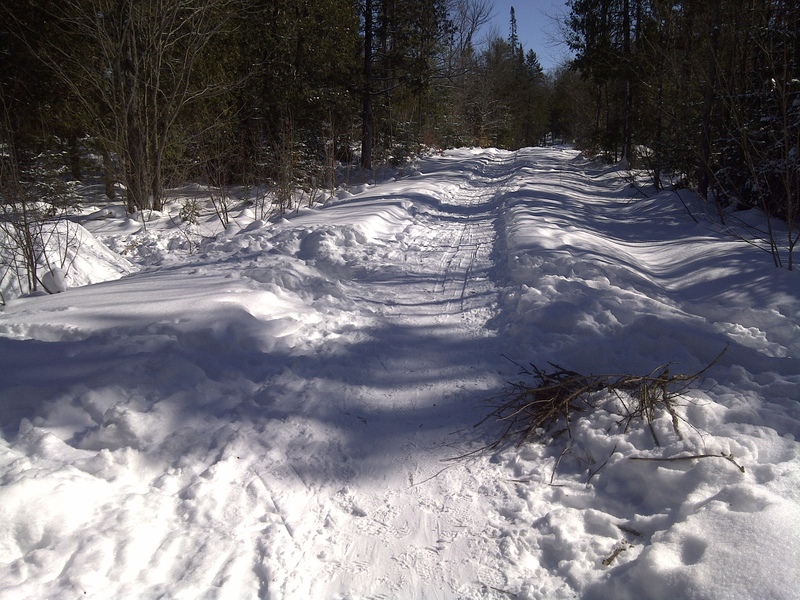 Although not easily noticeable, the structure may shrink due to this compaction. This is usually a great time to prepare lunch! A typical Canadian meal might consist of bannock cooked on a stick, Montreal bagels, poutine, and a glass of maple syrup. Dessert is usually tire, served on snow. When your quinzee has sufficiently compacted, it’s time to start digging it out. If your quinzee needs more time to settle, then you can keep busy by gathering some firewood or practising your favourite Canadian song. While gathering a little firewood, I had a chance to take a quick photo looking down the main street of my village. On the right you can see some of the kindling I’ve collected, and in the distance to the left you can see a quinzee. You typically want as small of a door opening as you can fit through. Start digging near, but above the base of the quinzee at a downward angle towards the centre. As you reach the centre, start digging outwards in all directions. The downward angle will prevent strong winds from blowing directly into the quinzee. The inner dome will keep heat from escaping. It takes some experience to get the shape right, but after years of practice, you’ll quickly become an expert. This process should take you about an hour. When you are digging inside of the quinzee, remember to always have your buddy on the outside in the event of collapse. While collapses are rare, they can happen, in particular if the weather is too warm, if you didn’t let your quinzee settle for long enough, or if you made your walls too thin or your roof too thick. It is important that your buddy pay attention, because the quinzee insulates you from sound (and cold) very well. To demonstrate this, scream or talk loudly while you’re inside the quinzee. Your buddy will not be able to hear you very easily. During the day, if you ask your buddy to seal off the entrance with their body, it will be very dark inside the quinzee, but you should be able to see faint blue areas where the walls are the thinnest and some light is coming in. You probably don’t want to dig much further in those areas. When you are finished digging out your quinzee, pull out one of the sticks in the roof to create an air hole for ventilation. You’ll probably want to gently smooth out the inside walls and roof with your gloved hand. This will prevent the jagged digging marks (snow stalactites) from dripping on you once you’re sleeping in the quinzee and your body heat is causing them to melt. 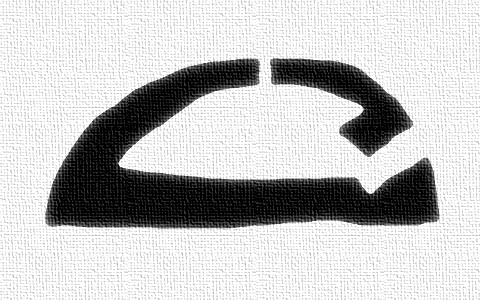 As a related optimization, some quinzee builders like to light a candle in the centre of the quinzee for a few hours to try to melt any variations on the inner walls, causing a glaze and preventing dripping. It’s customary to line the bottom of your quinzee with either a tarp, or if it’s available, some hay. The hay is a particularly comfortable bedding material because it soaks up excess moisture which would otherwise make your floor damp. In general, Canadians only line their quinzees with hay when royalty or a special guest is coming to visit. If you do not receive any hay when staying over at a friend’s place, please do not be offended as it is hard to come by in a country that has a winter climate for most of the year. For sleeping, orient your feet so they are closest to the door, and with your head away from it. When multiple people are lying next to each other in this way, the quinzee can be quite warm during cold winter nights. If you plan on leaving your home unattended for some time, it is common practice to destroy your quinzee so that small animals or children don’t get accidentally trapped inside should it be left unsupervised. Sadly, only a few days after I took these photos, a polar bear attacked my village and destroyed the quinzee! One positive outcome of the attack is that you can get a good look inside the quinzee and you see a nice cross-section of the walls. Fortunately, this won’t cost me much in building materials, but it will be some time before I have time to rebuild, and even longer before I have time to get a guest quinzee built! This entry was posted in technical and tagged canada, compaction, devops, gluster, maple syrup, o canada, planetfedora, polar bears, poutine, puppet, quinzee, snow, snow shelter, stratification, winter by purpleidea. Bookmark the permalink. While there may be a “meter” in “diameter”, it is never spelled “diametre”, even here in Canada. Haha, I’m glad you picked up on that! I thought I’d over do it a bit, although I think some dictionaries contain that spelling too!